As the last big update to iOS 10, iOS 10.3 is expected to release soon. And Apple seeded the second beta of iOS 10.3 update to developers on February 6, which allows us to see the new features before the official release of iOS 10.3. The major updates in iOS 10.3 include Find My AirPods, Apple ID Profile Page, Live Photo Album, Apple File System, and iCloud Storage Breakdown, etc. Here in this post, we’ll show you how to check your iCloud storage usage with a graphical breakdown in iOS 10.3. 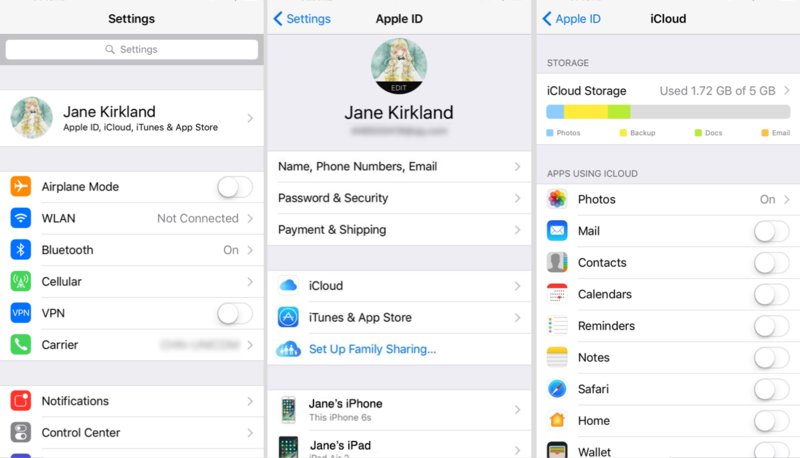 In iOS 10.2 and earlier, you can directly find iCloud option in the main screen of Settings, while in iOS 10.3, the iCloud setting option to move to Apple ID profile page. Go the Setting on your iPhone/iPad/iPod touch running iOS 10.3. Tap on your Apple ID profile section at the top of Settings screen > choose iCloud. Then you can see a graphical breakdown showing how much iCloud storage you a using and a list of apps using iCloud. In addition, you can touch the graphical breakdown to manage your storage or buy more iCloud storage.